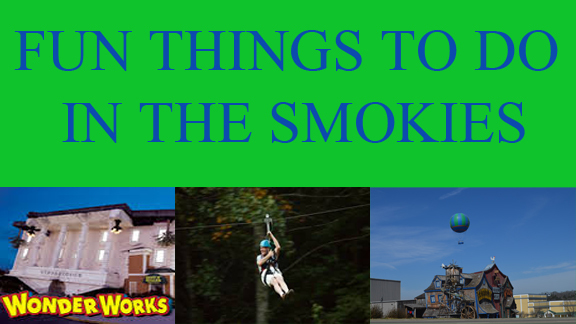 The Tennessee Smoky Mountains are a great place to visit and vacation with great places to stay and many fun things to do. Summertime opens up scores of outdoor activities like hiking, whitewater rafting, tubing, ziplining, horseback riding, ATV rides, exploring caves, miniature golf and go-kart racing, just to name a few activities. When the night falls you can continue playing outside, ride the Alpine Coaster, or catch a live show. T.G. Sheppard is making an appearance at Country Tonite and the Hatfield & McCoy's are filling up the concrete pool for a brand-new show. The Smoky Mountain cities of Gatlinburg, Pigeon Forge and Sevierville offer broad options for dining with unique restaurants in addition to well known chain restaurants offering steaks, seafood, Italian dishes, Oriental food, Cuban food and of course, Bar-B-Que, one of Tennessee's best known and best loved dishes. For your lodging choices you can choose from cabins, chalets, motels, RV Parks, campgrounds or hotels. And one of the most decorated hotels in the area is the Comfort Inn Apple Valley. The Comfort Inn is located on the Parkway on the boundary line between Sevierville and Pigeon Forge, with top quality restaurants like the Applewood Grill and Applewood Restaurants, within walking distance. You are also close to major attractions like WonderWorks, The Titanic Museum, Hatfield & McCoys Dinner Feud and the Smoky Mountain Opry. Enjoy genuine Southern Hospitality at the Comfort Inn Apple Valley and during your Smoky Mountain vacation. Check out more vacation options and get maps, coupons and more information at the Best Read Guide site at www.bestreadguidesmokymountains.com/.